We've talked about the amazing flavors and crust you get from baking bread in a cast iron skillet- you can't beat it. Your cast iron skillet or Dutch oven is probably the most reliable piece of equipment to have in the kitchen and let's face it, there's nothing like the smell of fresh bread. One of the main ingredients found in a bread recipe is flour (wheat), which helps gives it structure. Well, gluten is the proteins found in wheat- whether you're using all-purpose flour, whole wheat flour, rye flour, bread flour, cake flour. However, this can be a problem for folks who have gluten sensitivity, celiac disease, or who just avoid wheat-based foods altogether. If you can't consume wheat, you might think that regular bread is off of the list of foods you can eat. Guess what? That's absolutely wrong! Nowadays, there are a ton of gluten-free flour blends (I love Bob's Red Mill) and gluten-free flour alternatives that are easy to find and make gluten-free bread baking possible. 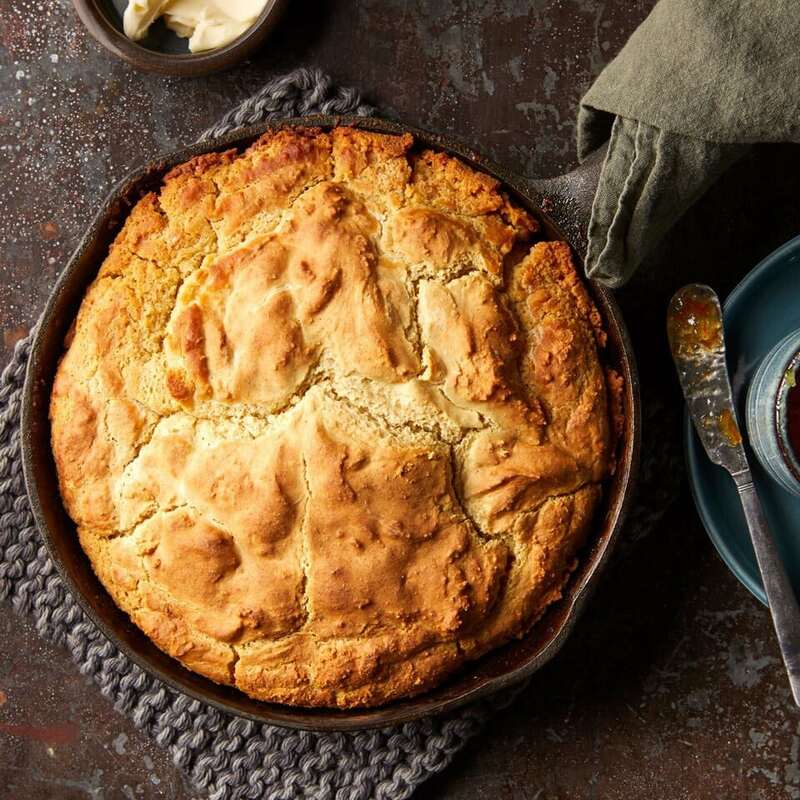 Get ready to jump into the kitchen and try out these cast iron skillet gluten-free bread recipes. Sourdough bread is on the very top of my list of favorite breads. It's a little funky and weird, but the flavor, mainly from the sourdough starter, is insanely delicious. I'll warn you though, sourdough bread takes some time and extra care to prepare. You'll have to start by making and feeding (yes, you have to feed it!) the sourdough starter, which can take a few days. Follow this recipe for a gluten-free starter. Even though sourdough bread takes a while to prepare, it's totally worth it and you'll be happy you did it. Just swap out the whole wheat flour for white or brown rice flour or a gf flour mix. No need to worry, you can have buttery and fluffy buttermilk biscuits even on a gluten-free diet. Made with butter, gluten-free flour blend, baking powder, and plenty of buttermilk, you'll forget that this is a gluten-free recipe. Helpful tip: lay a few empty butter wrappers over the top of the biscuits right from the oven. This simple no-knead bread doesn't even require a stand mixer. It contains a couple of ingredients like brown rice flour, tapioca flour, potato starch, xanthan gum, instant yeast, cheddar cheese, green onions, and gluten free beer, which gives this a lot of flavor. Let it rise in a warm place for about two hours and I bet you wouldn't guess this is gluten-free when you taste it. Golden brown and seriously comforting, you'll be eating this cornbread throughout the entire day. It has a great texture and doesn't require a yeast mixture, so that means there's no rising time involved. This is your basic gluten-free bread that's great to use for a sandwich or for dipping in olive oil. You can mix up your own gf flour blend or buy one pre-made at the store for this recipe. Also, since this bread is pretty plain, you can try adding in some fresh/dried herbs, sunflower seeds, kalamata olives, or flax seeds. I've tried baking focaccia bread in a regular bread pan or on a sheet pan, but there's nothing like baking it in a cast iron skillet. The edges get all crusty and golden brown and it's just so darn tasty! This gluten-free bread is so simple to make and you can spice it up with some herbs and cheese. Now that there's a bunch of gluten-free flour blends to choose from, you can really turn any regular recipe gluten-free. For these skillet cinnamon rolls, roll out the sweet bread dough and spread on a brown sugar, butter (or vegan butter), and cinnamon mixture, which turns gooey and delicious when baked. Even your friends who aren't gluten-free will want to devour these. Gluten-free dinner rolls for dinner? I'll take two, please. Soft on the inside and buttery on top, you'll want these for dinner every night. I love a slice of warm Irish Soda Bread with a lot of butter and jam on top. Beside cinnamon rolls, it's one of the most comforting breakfasts or snacks to have. Every summer on vacation, my husband likes to make a few loaves for everyone to share. For our friends who have a gluten allergy, they can still enjoy a few slices when the regular flour is swapped out for gluten-free flour. Flatbreads are a great base for personal pizzas, a healthy sandwich, or for just eating on its own. This is one of the easiest recipes you'll find for flatbreads and you can quickly double or triple the recipe. If you don't want to use nigella seeds, you can always use flax seeds or just keep them out altogether.